There is a system that follows the many screams. For some, who have zero trepidation of wearing out their own vocal chords, it involves asking players to read lips in real time or even turn to an assistant coach to finish a sentence. The madness of March has infinite layers, but it’s also near the end of the road for college basketball’s best. And that means head coaches have yelled. A lot. In practice, in games, at home, or over the piercing noise of an road crowd, coaches have to get their point across. It comes at an expense. Over five months ago, this college basketball season began, so while every group is still amped up, riding the emotion of having a shot at the whole thing, some voices are just, well, shot, too. 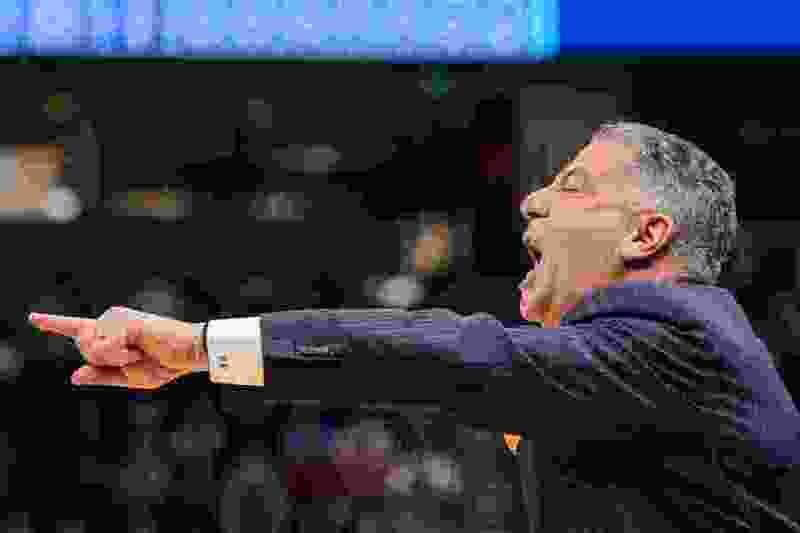 Following Auburn’s first-round win over New Mexico State Thursday in Salt Lake City, head coach Bruce Pearl took questions at the dais and it was painfully obvious he’d unleashed all the oxygen he had in his lungs. That’s what it boils down to. Some coaches scream. Some lose their ability to scream. Others are more reserved, less boisterous on the court. Pearl’s style demands players and assistant coaches being on the same page. So when the Tigers needed to close the game down the stretch against the Aggies, Pearl’s voice couldn’t reach the far end of the court — not over the bands playing, fans cheering, the atmosphere of the Big Dance living up to its rightful reputation. McCormick said there are times when, late in a game, Pearl tries to say something, but can’t. That’s when an assistant steps in to relay what play-call is needed or what defense to run. Auburn forward Horace Spencer said players must make it a point of emphasize to make eye contact, even far away on the court, to try and understand what’s coming from their head coach. And, yes, sometimes they have to try and read his lips or look for hand signals, too. Kansas coach Bill Self isn’t one to holler, but he deadpanned Friday that coaching this talented, young Jayhawk team might’ve made him purchase some Just For Men hair dye at some point this season. Like all teams, there are contingency plans for crowd noise, or in the case a coach can no longer shout instruction, they look for signals from the Kansas bench. Gonzaga assistant Donny Daniels said he tries to tell his friends in the profession a saying his dad told him growing up: “The only time you need to holler is when you’re hollering for help.” The longtime University of Utah assistant coach under the late legendary coach Rick Majerus said coaches do have to train their vocal chords for the longevity of a season. There’s no time to yell in the summer, he joked, that’s the offseason. Hot tea helps some, but not all. Majerus, Daniels recalls, would lose his voice but since his powerful voice carried better than most, he never slowed down. Unlike his old boss, Gonzaga head coach Mark Few is not one to get worked up and bark. Utah State’s Craig Smith loses his voice often. To help the constant raspiness, Smith sometimes carries throat lozenges in his pocket. As his Aggies awaited their first NCAA Tournament since 2011 this week, Smith had to resort to a more serious approach. His wife purchased a special throat spray that celebrity singers use.